we bless and thank you for having sent your dearly beloved son Jesus to us. the shaper of our salvation, the source of all peace, the ties that binds us. Pope Paul VI born Giovanni Battista Enrico Antonio Maria Montini on 26 September 1897. He served from 21 June 1963 to his death in 6 August 1978.
with understanding, indifference with solidarity. women of all races and tongues. 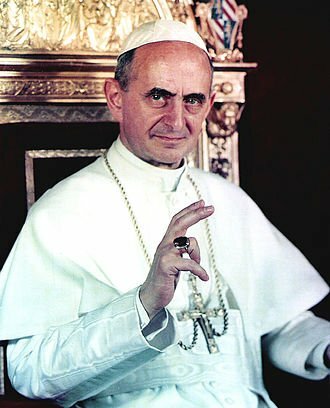 Pope Paul VI, born Giovanni Battista Enrico Antonio Maria Montini on 26 September 1897. He served as Pope from 21 June 1963 until his death on 6 August 1978. Succeeding John XXIII, he continued the Second Vatican Council which he closed in 1965, implementing its numerous reforms, and fostered improved ecumenical relations with Eastern Orthodox and Protestants.